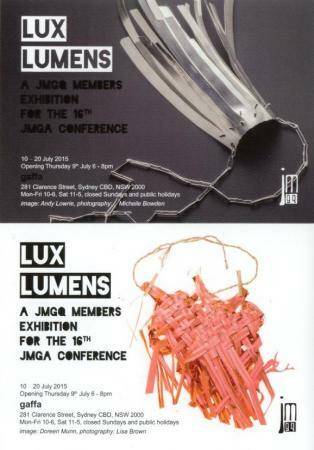 2015 is the UNESCO International Year of Light, and to celebrate this, JMGQ members are invited to submit work that reflects themes related to light, and also draws upon the idea of us as representatives from Queensland, the ‘Sunshine State'. Light is present all around us, fundamental to our existence, governing the rhythms of life. It is essential to the visual arts, and a source of beauty in its own right. It plays a major role in many rapidly advancing technological applications - as a source of energy, in communications and medical sciences to name a few, and has far reaching implications in economics and energy use around the world. Light transcends time as it travels across space from distant stars, telling us of events that occurred thousands of years ago. As we seek to unlock the secrets of the origins of the universe, light aids us on both the micro and macro scale. For jewellers and metalsmiths light plays an especially important role, through the interplay of reflective and refractive surfaces. In combination with the conference theme of Edges Borders Gaps, a questioning of the positioning of contemporary jewellery within art and society, light offers fertile territory for further exploration of the field.